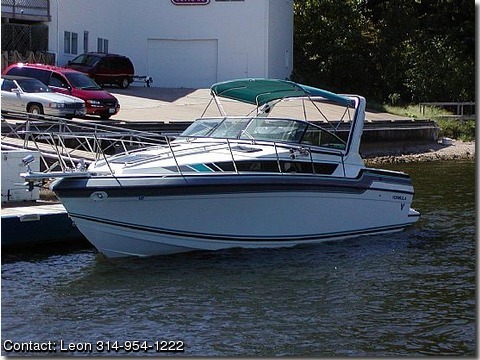 This one has it all, Formula Performance Cruiser that sleeps 6 adults, she is in excellent condition with fully functional systems just under 800 hours, equipped with twin 454 Magnums 330hp and Bravo I Outdrives swinging stainless steel 3 blade props, with a top speed of 45mph and cruises easily at 35. Boat is currently on a lift at Lake of the Ozarks with the slip lease paid thru March 2007. Cabin sleeps 6 adults and is equipped with A/C, Electric Heater, Alpine am/fm stereo cd, generator 4.5KW, Vacu-Flush head, Dual Fuel Stove, stainless sink, microwave, 12/110v Refrigerator, new pumps, built-i bender, Central Vac, hot water heater & CO detector. Cockpit has newer berber snap in carpet, cockpit cover, full storage cover, transom shower &Bimini Top with Full Enclosures. Call or email for additional pictures and information. Private owner will entertain reasonable offers.